It will be a busy weekend in soccer across the globe as games both abroad and in MLS will carry a lot of intrigue for American fans. Key U.S. internationals and youth internationals will have a lot at stake for both their teams and on an individual basis. With the U.S. national team preparing for the Gold Cup, the U.S. U-20 team preparing for the World Cup, and the U-23 beginning preparations for Olympic qualifying, players will be looking to build their cases to be part of these teams. With all of this on the line, here are the 10 best games to follow this weekend from an American perspective. Two U.S. national team starters will possibly face each other on Saturday as both teams are trying to solidify their standings for spots in European competitions next season. Tyler Adams, 20, is trying to recover from a thigh injury in time for Saturday’s game. He injured himself two weeks ago in Leipzig’s 5-0 win over Hertha. The former New York Red Bull central midfielder has been outstanding since making the move to the Bundesliga in January and has been a huge addition to Leipzig – which sits in third place and is in-line for a spot in the Champions League next season. In 747 minutes with Adams on the field, Leipzig has conceded just one goal. Meanwhile, John Brooks is having one of the most consistent and best seasons of his career. The central defender has been a mainstay for a dramatically improved Wolfsburg team that only avoided relegation last season via a playoff and is now in sixth place – the Bundesliga’s final Europa League spot. The league’s 2018 expansion team will face off against the 2019 expansion team on Saturday in the City of Angels. Cincinnati has been more than respectable in its first six weeks as it has accumulated eight points through six games. American fans will certainly be impressed with left back Greg Garza and left midfielder Kenny Saief, who are playing well and looking to reclaim spots on the U.S. national team. Frankie Amaya could also take part as the first overall pick in the 2019 draft is looking to make a case to be on the U.S. U-20 World Cup team. Cincinnati will have a massive test on its hands as LAFC is the best team in the league at the moment. It enters into Saturday’s game with 16 points through six games. Former United States national team head coach Bob Bradley has the team firing on all cylinders and it is led by Mexican forward Carlos Vela, who is the early front-runner for the league MVP. LAFC also boasts two U.S. internationals in Walker Zimmerman, who is making a strong case to be a central defender on the Gold Cup team. Forward Cristian Ramirez is also in the mix and has one goal in five games for LAFC. The MLS Cup finalists in 2016 and 2017 will meet on Saturday in Seattle. Both teams are off to strong starts to the season. Toronto was embarrassed by an early ouster from the Concacaf Champions League but has since been boosted by the return of Jozy Altidore and the addition of Alejandro Pozuelo. Altidore’s return is of importance to the United States national team as the New Jersey-born forward has three goals in three games since recovering from his foot injury. In addition to Altidore, Michael Bradley is also trying to gain momentum heading into the Gold Cup as he is still in the national team picture early in Gregg Berhalter’s tenure. The Spaniard Pozuelo, meanwhile, has been eye opening since his expensive signing from Belgium’s Gent. 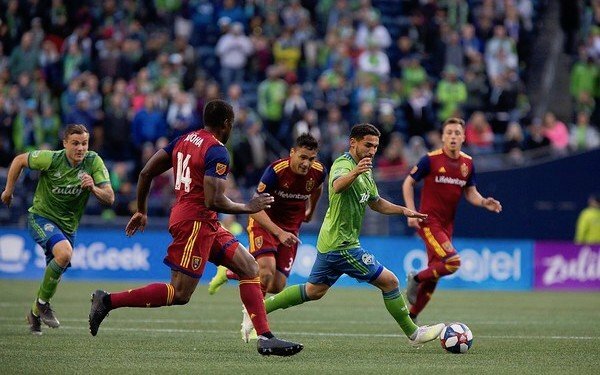 Seattle is one of the few teams that looks to be able to challenge LAFC in the early part of the season and it has 13 points through five games. While it has two players in Cristian Roldan and Jordan Morris, who are on the bubble with the U.S. national team, it has foreign star power in Peruvian Manny Ruidiaz, who has three goals in four games, the consistently strong Nicolas Lodeiro from Uruguay who has two goals so far on the early season. Neither team has lost yet on the season and both are trying to make early-season statements. The past of the U.S. national team backline could square off against the future of the United States national team in the Championship when Geoff Cameron of Queens Park Rangers (on loan from Stoke City) faces Cameron Carter-Vickers (on loan from Tottenham Hotspur). Not much is on line for either team although Queens Park Rangers has faded in recent weeks and is only six points clear of the relegation zone at the moment. Swansea City, meanwhile, is in 13th place of the 24-team league and is neither a threat for promotion nor relegation. What makes this game so interesting is that both players are at their clubs on loan and are at a crossroads at different stages of their careers. Can Cameron, who will turn 34 this summer, play well enough to earn another contract in England or return to Stoke. Or does he want to return to MLS where he began his career? Or does he want to retire? After missing a long stretch due to injuries, he is back on the field and the season’s final weeks will give us a an indication of his level. As for Carter-Vickers, he has done well for a good Swansea City but he has now played on loan from Tottenham at three different clubs in the Championships. Is that his level? Will he go on loan to another Championship team? Or is he ready to try to push for a spot on a Premier League team somewhere? Boyd has been absolutely tearing the Super Lig up since is arrival at Ankaragucu in January. In eight games, he has three goals and four assists. The speedy winger has been blowing past Super Lig defenses with ease. But Boyd is a dual national. Born in New Zealand to an American mother and a New Zealander father, he moved to Southern California when he was just a few months old and lived there until he was 10 before returning to New Zealand. He has played for New Zealand at the youth national team level and for its full national team in friendlies. The U.S. national team is a possibility for Boyd if he were to file a one-time switch with FIFA and in December, he told American Soccer Now he would strongly consider it should he be asked. But with Boyd having success nearly every week, he will likely have to decide on his international future sooner than later. Fabian Johnson and Borussia Monchengladbach are in the top five of the Bundesliga and in line for a Europa League berth next year. But if it wants to erase the four-point deficit that separate it from fourth place and a spot in the Champions League, it needs to win games like Saturday when it will visit a very bad Hannover team which is in last place and has one of the worst goal differentials in the Bundesliga since East and West Germany united. Technically, Hannover has six games to erase a seven point deficit for 16th place (and a spot in the relegation playoff – as opposed to straight relegation) but in reality lacks the firepower for such a turnover. The club has a coach who the president has strongly indicated won’t be back next year and no one knows what the approach will be in the 2.Bundesliga next year. But right now it is a mess. Manager Thomas Doll had scathing words on U.S. national team forward Bobby Wood who he called a “sensitive player” and will go back to his parent club, Hamburg, next year. But last week, U.S. U-20 forward Sebastian Soto made his Bundesliga debut when he made a late-cameo in a 2-0 loss to Wolfsburg. As the club prepares for life in the 2.Bundesliga, Soto could start to get more opportunities -- which would only give him more confidence ahead of the U-20 World Cup. 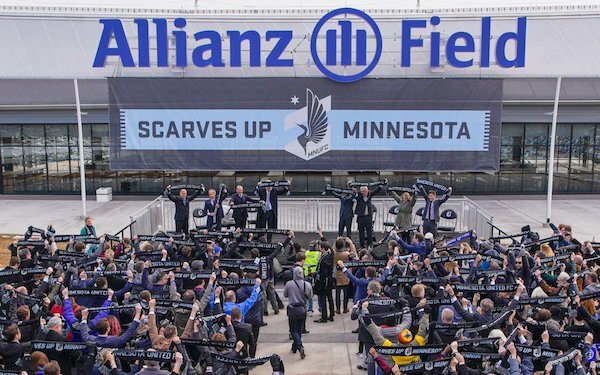 On Saturday, Minnesota United will unveil the latest gem in Major League Soccer with the first game ever at the gorgeous Allianz Field in St. Paul. The 19,400-seat stadium will be at full capacity for the first game when New York City FC comes to town. NYCFC has been bad this year with four draws and a loss in five games. From an American perspective, it has U.S. U-20 hopeful James Sands, who starts in defensive midfield, and national team backup goalkeeper Sean Johnson – who has been one of the team’s few bright spots. But NYCFC players will surely be jealous on Saturday as NYCFC plays in the worst stadium in the league at Yankee stadium, which has a poor surface for soccer and very narrow dimensions. The team is essentially homeless and is crashing at a baseball stadium with no indication it will find a permanent home anytime soon. It’s stadium situation is one of the black marks on the league. Now NYCFC will be part of the opening of a first-rate new stadium that continues the raise the bar in terms of the league’s infrastructure. The NYCFC players will see first-hand how good things can be in the league and then afterward will return to a bad situation in the Bronx. After a pair of bad seasons since its arrival in MLS, Minnesota has been improved in the league with three wins and two losses in five road games to start the season. It weathered a handful of away games and will now get a large share of home games in the months ahead. Two of the more surprising teams in MLS at the early part of the season will face off on Saturday night in Carson when the West’s third-place team, the Galaxy, hosts the Easts fourth-place team, the Philadelphia Union. For casual fans, the foreign star power will get a lot of attention. Zlatan Ibrahimovic always draws the spotlight and his play is usually worth the price of admission. Philadelphia, however, has Mexican international Marco Fabian, who will draw eyes in the Los Angeles area where El Tri is extremely popular. But this game offers a lot for American fans. The Galaxy have U.S. international Sebastian Lletget, who is looking to secure a big role with the national team ahead of the Gold Cup. Meanwhile, Joe Corona has not been with Berhalter but is looking to get back into the picture after leaving Liga MX for the first time earlier this season. Philadelphia, meanwhile, boasts an impressive number of players who could play a part with the U.S. U-20 and U-23 teams this year. Brendan Aaronson has been one the most surprising young players in the league and the U-20 eligible midfielder helped Philadelphia surpass expectations to start this year. With continued success, he could find himself on the U.S. U-20 World Cup team. Auston Trusty, 23, is a mainstay on Philadelphia’s backline and should be an important part of the U.S. U-23 team for Olympic qualifying. Philadelphia could also potentially feature U.S. U-20 central defender Mark McKenzie and U-20 midfielder Anthony Fontana. Meanwhile, former U.S. national team midfielder Alejandro Bedoya is frequently cited as a mentor to many of Philadelphia’s young players. Last week, it looked like Reading was going to continue to coast away from the relegation zone. But a bad loss to Hull City last weekend and disappointing midweek 2-2 draw to Norwich (where it held a 1-0 lead into the 86th minute but conceded twice and needed a stoppage time equalizer to salvage a point) has it sitting just two points clear of the relegation zone. It is one of the most important tests for Matt Miazga at the club level. Whether at New York Red Bulls or Vitesse, Miazga was on teams at the top of the standings. Now, he is in a relegation fight where defenses often determine survival. Mid-table Brentford at home is a winnable game for Reading but it will have to shake off two disappointing results. It’s the story of two different teams. One team doesn’t develop its own players, the other team does. One team tries to get by on older Designated Players, the other tries to get by with local homegrowns. The latter team is in last place in the Western Conference, the other is in fifth. Portland is starting the season on a long-road trip that will extend until June 1 due to upgrades at its home stadium. But the team has been terrible with just one point from five games and a -10 goal differential. Last week was a low point as it dropped a 3-0 decision to a San Jose team that had lost all four of its games to start the season. FC Dallas is a fun team to watch at the moment with its youthful approach under new coach Luchi Gonzalez –- who was previously the team’s academy director. At the center of it is Paxton Pomykal, who will likely be in the driver’s seat of the U.S. U-20 team’s attack at the World Cup this summer. Jesus Ferreira, 18, nears his American citizenship and could also have a bright international future. U-20 eligible Edwin Cerrillo is making a late push to make Tab Ramos’ roster for the World Cup after three starts. Likely a core member of the 2021 U-20 team, Thomas Roberts has also begun to play. Right back Reggie Cannon, 20, will probably be the starter for the Olympic team. Watching FC Dallas is a look at some of the brightest young American players who could go on and do big things for American soccer. But Dallas isn’t just playing these players, they’re winning with these players and giving them confidence early in their careers. Photos: Minnesota United, Lindsey Wasson / Sounders FC Communications.